Develop a semi-structured interview tool for APS caseworkers to use when gathering information about clients’ decision-making abilities. 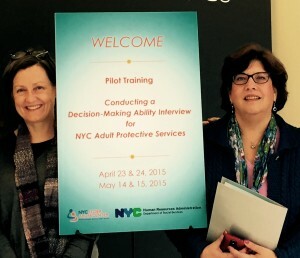 Develop and conduct a pilot curriculum to teach NYC Adult Protective Services (APS) caseworkers and supervisors to gather information about APS client decision-making abilities. Obtain feedback from APS caseworkers and supervisors on the IDA and training. Develop an ethically sound, semi-structured interview tool, IDA (Interview of Decisional Abilities), for use by NYC APS caseworkers. Develop and conduct a pilot training for APS caseworkers and supervisors in the use of IDA. The training imparted conceptual knowledge about decision-making capacity, provided experiential training necessary to support APS caseworkers in gathering information about clients’ decision-making abilities, encouraged triaging referrals to psychiatry for further assessment and supported supervisors in their oversight of caseworkers’ provision of these services. Establish replicable and sustainable results that are likely to impact how APS in NYC and other localities gather information on client decision-making abilities in the future. Developed the Interview of Decisional Abilities – IDA: The purpose of IDA is to help APS caseworkers gather information about a client’s decision-making abilities. Developing IDA required a careful review of the ACED (as components of IDA borrow from both the concepts and the structure of The Assessment of Capacity for Everyday Decision-making (the ACED), developed by Drs. Lai and Karlawish). It was imperative to develop a semi-structured interview tool that accurately captured a client’s understanding, appreciation, and reasoning of his/her risk and service options and that would be understood by APS caseworkers. This iterative development process took 24 months with feedback from the APS training pilot participants, APS focus groups, and the full PPC. IDA has three steps, or anchor points, which includes asking the client his/her understanding in general (Step 1), on a personal level (Step 2) and ability to reason future options to address a risk (Step 3). Based on these conversation – at the end of each step – the caseworker makes a judgment about the client’s understanding of and reasoning to address risk and supports it with statements, quotes and/or observations . In addition, prior to Step 1, the caseworker completes a pre IDA cover sheet, which helps the APS caseworker identify the issue with the most imminent, acute risk to use with IDA. Each of the subsequent three steps provide simple instructions for utilization and clear information on what APS caseworkers should do with the information gathered. After the three steps are completed, the APS caseworker completes the Post-IDA that addresses whether sufficient information was collected to make a determination of person’s understanding of risk or willingness to accept service. APS caseworkers utilize IDA during the APS assessment process, but IDA is only one part of the overall APS assessment process. IDA is uniquely designed to allow caseworkers to easily synchronize their assessment results with appropriate interventions. Ensures that the key elements of decision-making ability are addressed. Improves the caseworker’s understanding of the barriers for a person to accept a service offered; it does not to try to persuade a person to accept a service. Focuses caseworker attention on listening to how a person thinks about the risk(s) s/he is facing. Captures detailed information on client thinking. Assists in engaging in conversation about risk and building rapport. Improves documentation in the APS database, allowing for a common language across the APS system about clients’ decision-making abilities. Increases caseworker confidence when closing a case when a person with decision-making ability refuses services and remains at risk. 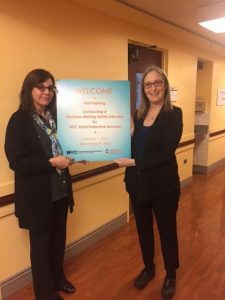 Phase One Training 2015: Peg Horan, LMSW, NYCEAC MDT Coordinator/Elder Abuse Prevention Specialist & Dr. Veronica LoFaso, NYCEAC MDT Geriatrician. Conducted training for NYC APS caseworkers and supervisors: NYC APS leadership identified APS caseworkers and supervisors from various levels of experience and skill to participate in the IDA training in Spring 2015 (Phase One) and Fall 2016 (Phase Two). A 2-day pilot training was completed twice in Phase One and once in Phase Two (utilizing revised materials), reaching a total of 75 APS caseworkers and supervisors. The trainings included weeks of field-testing during which caseworkers utilized IDA with their clients. Following the field-testing, the training faculty held focus groups to understand the benefits and challenges of utilizing IDA. This feedback was then used to revise IDA. The training utilized didactic presentation, case studies, experiential methods and discussion to convey information and teach APS caseworkers and supervisors to conduct the IDA interview. Practicing IDA was key to simulate real life experiences during APS assessments in which caseworkers do not know possible responses and need to engage the person and probe in order to formulate a judgment in each IDA step. During the training, APS caseworkers had the opportunity to: a) practice IDA questions; b) apply IDA to case studies; and c) document conclusions including observations, quotes or information that contributed to judgment. APS supervisors were taught the above as well as how to supervise APS caseworkers utilizing IDA with clients. An overview of cognitive impairment and decision-making abilities. Step-by-step instruction on the use of IDA. Role-play exercises using case studies developed for utilizing IDA. Ongoing supervision; and the opportunity for practice and feedback over time. Phase Two Training 2016: Risa Breckman, LCSW, NYCEAC Director and Pamela Ansell, MSW, Director of Special Projects. Obtained feedback from training participants and trainers: This project charted new territory. Thus, a message of “learning together” and encouraging conversation was conveyed to the trainees throughout the training. In support of this message, the PPC designed an evaluation process promoting honest feedback, both positive and negative. Critical feedback on the feasibility of using IDA in the field, understanding concepts related to capacity and decisional abilities, and effective teaching methods gathered from Phase One and Phase Two training were fully integrated into the project’s planning for finalizing materials. This feedback came from both trainers and participants. The participants completed a pre/post-test and feedback forms and provided feedback on notecards during a training exercise and then again during a post-training phone meeting. The PPC trainers discussed the training pilot’s overall successes and challenges. The project results provide insight into the benefits, complexities and challenges of standardizing how APS caseworkers assess decision-making capacity. In 2016, the Massachusetts (MA) Executive Office of Elder Affairs expressed interest in using the IDA tool with its Adult Protective Services staff statewide. A train-the-trainer model was considered the most feasible approach to disseminating the IDA tool. A select group of MA supervisors were trained by the WCM/NYCEAC Team with the goal of then going back to MA and training field workers themselves. The tool was refined and adapted for MA use (IDA 3.0-MA) and a training manual was created to guide the new trainers as they conducted trainings throughout the state. Preliminary reports from supervisors and workers has been positive. In 2017, the Administration for Community Living funded investigators from the University of Southern California to pilot the IDA tool and training manual for use is selected counties in California. Again, a train-the-trainer model was adopted and the WCM/NYCEAC team trained a group of skilled clinicians who would then disseminate the IDA tool throughout California. The California initiative will include a much-needed analysis of the validity of the tool and it’s impact on the work of APS staff. Other organizations and agencies continue to express interest in the IDA tool and we envision it being a very useful tool to address the universal challenge that APS workers have in the determining the decision-making ability of their clients at risk.